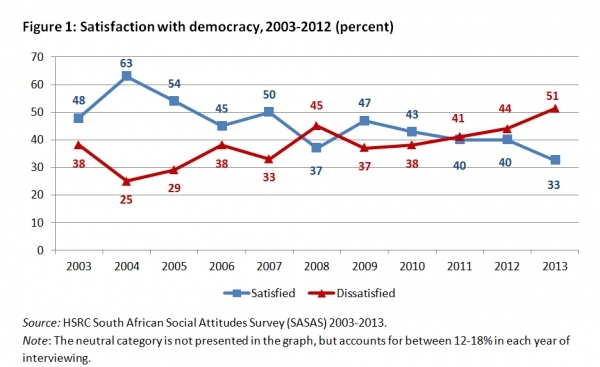 Just over half of the population (51%) is unsatisfied with the state of democracy in South Africa, and only 33% were satisfied with the way democracy is working, according to the latest findings of the South African Social Attitudes Survey (SASAS), conducted annually by the Human Sciences Research Council since 2003. 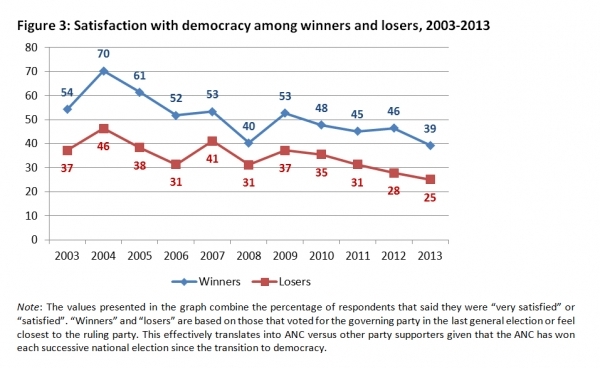 This is the lowest recorded level of satisfaction with democracy since the establishment of the SASAS series. One of the most important indicators of support for any country’s political system is how satisfied its citizens are with democracy and is one of the most common measures of political support for democracy employed in survey research. Since 2003, SASAS has included in its surveys a set of measures concerning political support in which the satisfaction with democracy has been included as a core item. The number of respondents in each survey from 2003 to 2013 ranged between 2 500 and 3 300. The latest survey round, which was conducted between October and December 2013, consisted of a representative sample of 2 885 respondents living in private residencies. The specific question asked of respondents was as follows: ‘How satisfied or dissatisfied are you with the way democracy is working in South Africa?’, with responses captured on a five-point scale ranging from ‘very satisfied’ to ‘very dissatisfied’. In examining the 2003 survey results, we found that before the 2004 national and provincial elections, 48% of the adult population were satisfied with democracy and 38% were discontent. Between 2003 and 2008, a slight reversal in trends was apparent. The 2008 SASAS results showed that, for the first time, a greater share of people were dissatisfied than satisfied (45% versus 37%). * Neutral responses to this question are not included in the graph and as a result the percentages do not add up to 100 per cent. 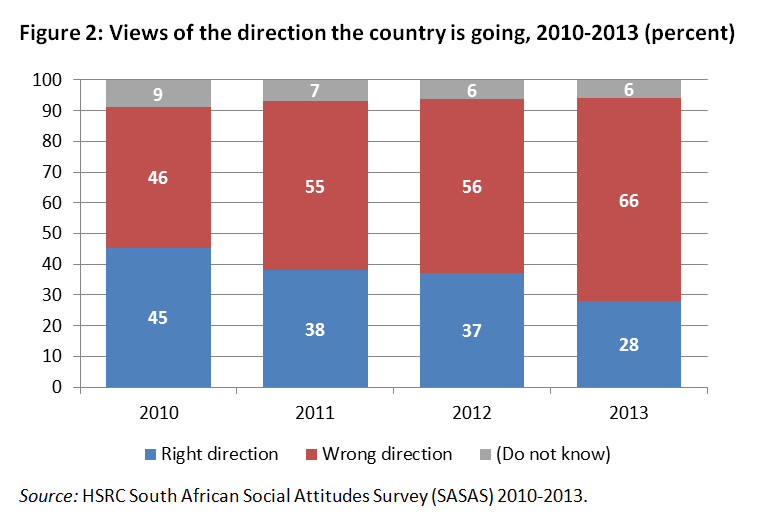 At the time of the SASAS round in late 2013, 51% of the participants expressed their discontent, while only 33% were satisfied with the way democracy is working. 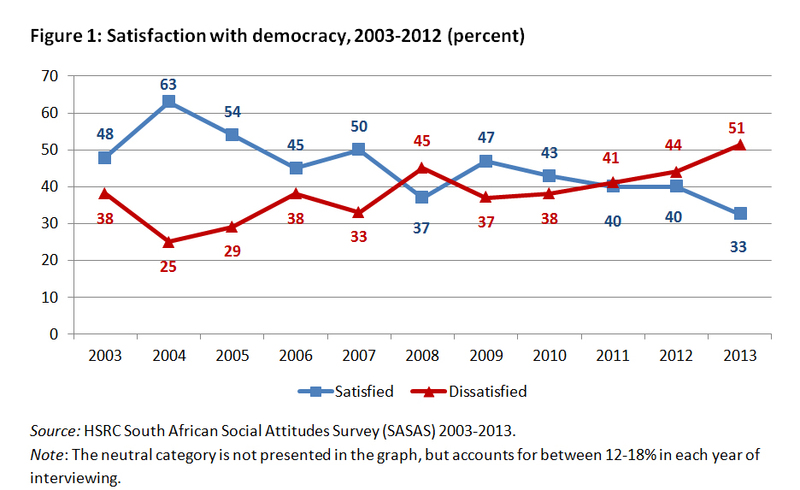 This reflected a complete reversal of the 2003 results, and was the lowest recorded level of satisfaction with democracy since the establishment of the SASAS series. 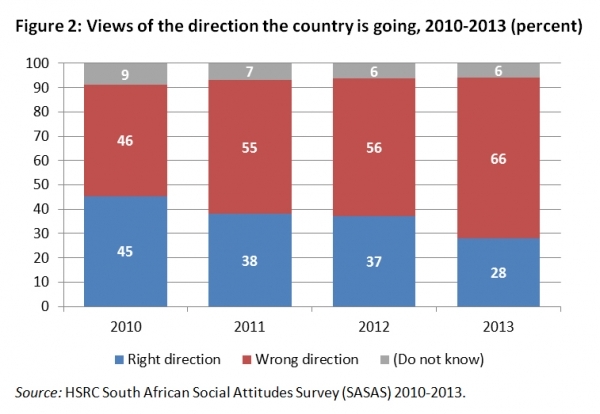 To further assess the public’s view of democratic performance in general, survey respondents were required to evaluate whether they felt that things in South Africa were going in the right or in the wrong direction. Does being a political minority or majority matter? 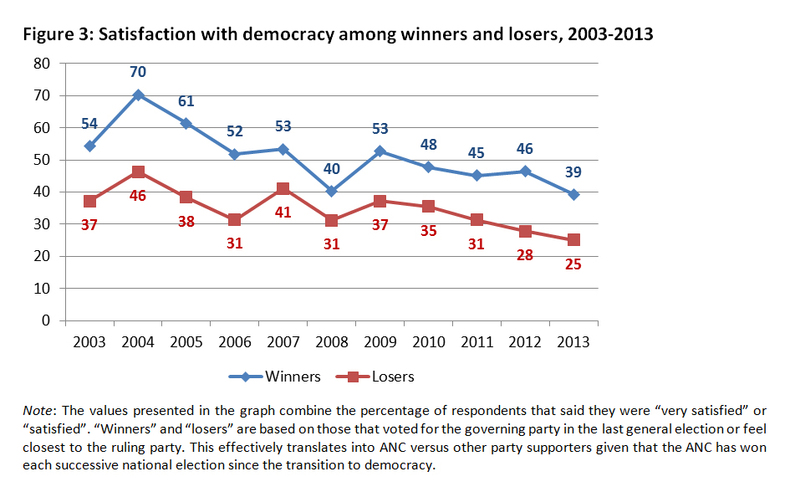 From the patterns and trends presented in Figure 3, we found that those who have vested interest in, and who voted for the ANC, were more satisfied with the way democracy was working. In each round of interviewing since 2003, satisfaction with demo was consistently higher among the winners of democratic elections than those on the losing side. These differences were all statistically significant. However, it is also immediately apparent from the results that satisfaction with democracy has declined for winners and losers alike. In the case of those supporting the ruling party, satisfaction levels have fallen 15 percentage points over the decade, from 54% to 39%, while satisfaction declined by 12 percentage points for those supporting opposition parties. This is an important finding for it suggests that citizen satisfaction with the performance of democracy has begun to diminish even for those identifying with the ruling party. This implies that there are mounting concerns about aspects of how the democratic system is working, irrespective of political persuasion.